Home › Toys › Yu-Gi-Oh! - The Masked Beast (Dl2-001) - Duelist League Prize Card - Limited ..
Yu-Gi-Oh! - The Masked Beast (Dl2-001) - Duelist League Prize Card - Limited ..
From the Duelist League Prize Card set. You will receive the Limited Edition version of this card. Yu-Gi-Oh! is a strategic trading card game in two players Duel each otherusing a variety of Monster, Spell, and Trap Cards to defeat their opponent'smonsters and be the first to drop the other's Life Points to 0. 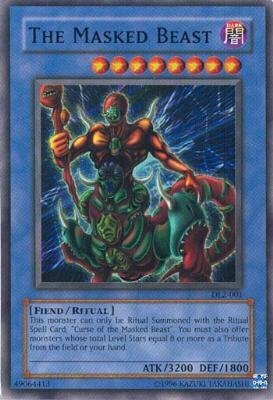 Card Name: The Masked Beast Card Type: Ritual Monster Card Number: DL2-001 Set: Duelist League Prize Card Attack/Defense: 3200/1800 Attribute: Dark Level: 8 Monster Type: Fiend Passcode: 49064413 Card Text: This monster can only be Ritual Summoned with the Ritual Spell Card, 'Curse of the Masked Beast'. You must also Tribute monsters whose total Level Stars equal 8 or more from the field or your hand.